At first thought, you might think it would be hard to close a motorway for days because of a fire. But not, it turns out, when the fire occurs beneath the motorway. 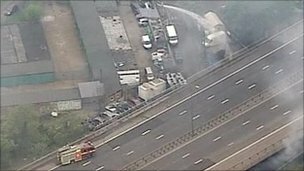 On Friday a fire occurred in a scrap yard which was located under a bridge of the M1 motorway at Watford, North London, in England. The fire was severe and damaged the bridge supporting the motorway. As a result the motorway was closed last weekend. This caused serious traffic congestion. The motorway has now partially reopened, while inspections and repairs are carried out. The bridge has been damaged and it will be propped to safeguard it against collapse while inspections and repairs are carried out. 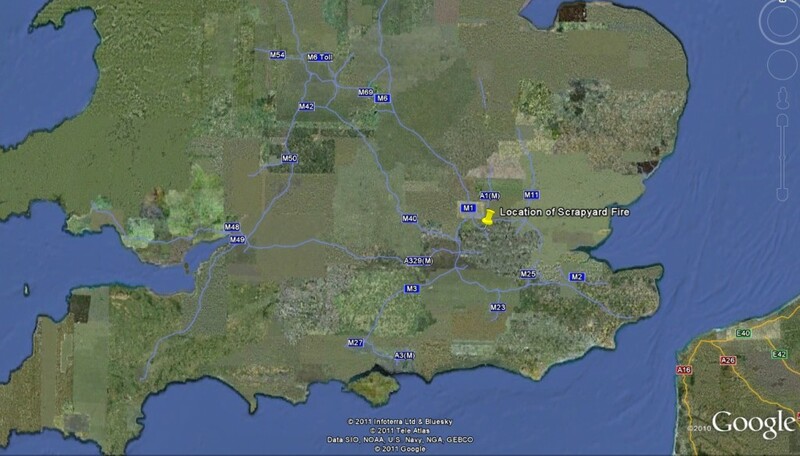 In hindsight allowing a scrap yard below one of the most important motorways in the UK was a mistake. The bridge was constructed using precast reinforced concrete members. If the fire was sufficiently severe the bridge could have collapsed. Reinforced concrete is composed of two materials: steel and concrete. The steel bars are cast inside concrete to provide additional strength. Individually concrete loses significant strength at 400 °C while steel does so at a much lower temperature, 200 °C. However in the case of reinforced concrete the steel is protected by a layer of concrete. But unfortunately as steel expands when heated, a severe fire will cause the steel while expanding to push the concrete off (known as spalling) and thus exposing the steel. The steel is then directly exposed to the high temperatures, and collapse can occur if the fire is severe and the structural system not robust enough. How will it be fixed? Removal of any damaged and weakened concrete. Removal of any weakened reinforcing steel and then new replacement steel welded into position. Replacement of removed concrete with high quality structural repair mortar. As a final step it would be prudent to check any other age related defects the bridge may have developed and fix those also. And finally ensure no combustible material is stored under the bridge, and others, in the future. While the motorway is expected to be fully open within a week, because the bridge will be temporarily propped by scaffolding. I would imagine that the repairs will take many weeks to complete.